David, my colleague owned a broken rosary, with missing beads. Knowing that I love doing wire wrapping, he lets me redo it for him. 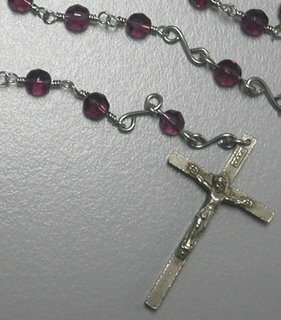 I looked for suitable beads and reuse the cross and center piece of the rosary (don’t know what it is called). And he was very happy and satisfied with the outcome. Instead of just bending the wire to link to the next bead, I wire wrapped each one of them individually (see close-up photo). This way the wire will not bend open as in a normal bended wire rosary. 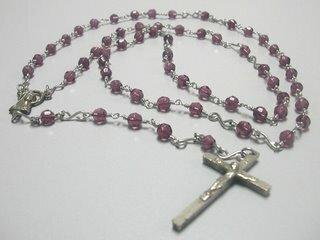 I am very sure this rosary will last longer if not for lifetime. Maybe he can inherit it to his son or daughter….just joking. Labels: Rosary | Cross , Wire Jewelry Share it!